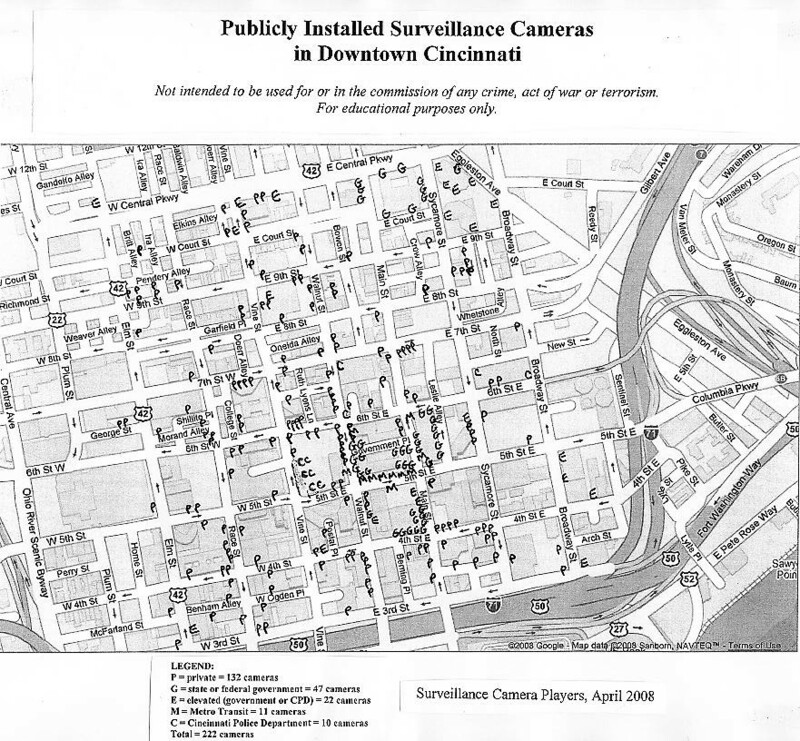 In November 2005, and then again in April 2008, Bill Brown of the Surveillance Camera Players (SCP) made a map of surveillance cameras installed in public places in downtown Cincinnati, Ohio. On both occasions, Bill gave a walking tour (free, open to the public) that was based upon the "new" map. The first map, which was made hastily, appears here, and the first walking tour was discussed here. In what follows, we offer a comparison between the two maps, and an account of the second walking tour. 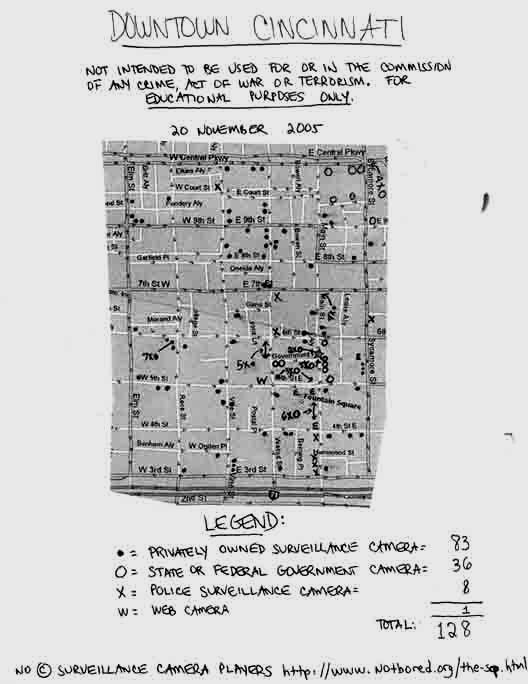 Since making our first map, we have learned that cameras operated by the Cincinnati Police Department (CPD) have been installed in three waves: first, from 1996-1999, mostly in high-crime areas outside the old city core (Findlay Market, Northside and Hopkins Park); second, between 2002 and 2003, mostly in response to the 2001 riots; and third, between 2006 and the present, in response to the availability of funds, and better and less-expensive video-surveillance technology. Fiber-optic networks and Chicago-style "gunshot detectors" have been announced, but not yet deployed. Over the course of the last 10 or 12 years, serious doubts about the effectiveness of video surveillance have voiced by both City Hall and the CPD. For example: The Cincinnati Inquirer reported in 2001 that "City Manager John Shirey said they were too expensive, at $24,502 each, and that they displaced crime more than helped with investigations or arrests. Police said no crimes had ever been solved based on the cameras"; and in 2003 quoted Cincinnati Police Capt. Kimberly Frey as saying "We've never really gotten anything useful from them." But some politicians and officers have remain impressed with (or have even hitched their career-wagons to) the widespread use of video surveillance in public places, precisely because the technology has gotten so good since 2003. According to an Associated Press article dated 2005, "The technology is just so good," said Lt. Col. James Whalen, commander for the district including Over-the-Rhine. "The pictures are very, very clear. You can count the pieces of crack in somebody's hand. You can see the denominations of money." At 2 pm on Sunday 27 April 2008, Bill led a walking tour that began underneath a CPD camera at the northeast corner of Walnut and Sixth Streets. About 20 or 25 people attended. (Click here for a photo.) Though it was 95% white (one black male in attendance), the group's age was diverse (between 18 and 65), equally mixed between men and women, diverse in socio-economic status (students, currently employed workers, retirees). Almost everyone stayed until the end. 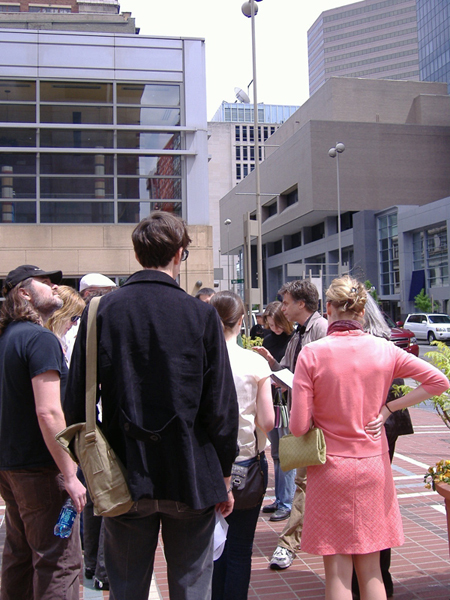 Unlike the walking tour presented in November 2005, this one drew no response from the police, perhaps because 1) CityBeat (local rag) did not preview it, as before, though a CityBeat freelancer did come to [and write about] the most recent tour; 2) the group congregated in front of the Aronoff Arts Center and not the Federal Building, and 3) all almost of the available officers (foot patrol, bicycle and horseback) were participating in and/or guarding a memorial to a local solider killed in Iraq. A local blogger attended the walking tour, and she filed the following report. In addition to what we posted as "comments" to this blog entry, we have the following things to say. Though she includes a picture of a sign accompanying a publicly installed surveillance camera -- this camera wasn't part of the tour, so the blogger found it on her own, but it is part of our map and we know exactly where this sign/camera are placed (a church!) -- "Visualingual" doesn't recall for her readers the insistence with which the tour guide pointed out the otherwise total absence of such signs from downtown and the illogic of failing to post such signs (the "logic" of deterrence etc). She also didn't mention that the position of the tour guide was that all surveillance cameras should be removed from public places, which requires that the distinction between public and private places be reasserted, expanded and defended. If an area is indeed dangerous, an officer should be posted there. The replacement of officers with cameras promotes the further evacuation of downtown centers (that is to say, black and poor communities), the abstraction of social relations, the spectacularization of law enforcement, the militarization of the police and the depersonalization of death. The second picture included by "Visualingual" shows three cameras hanging from a pole at the southwest corner of the Federal Building. Each globe (looks like a light or an ornament of some kind, doesn't it?) contains a small camera that can pan around 360 degrees, tilt from horizontal to vertical, and zoom in anywhere from 15 to 1500 times (depending on sophistication/cost). The fact that there are three such cameras -- when only one would suffice, that is, if it was watched continuously in "real time" -- well, this indicates that either there are three "real-time" watchers (doubtful), or each camera is not swiveling around, but staying fixed in place, and recording directly to tape, without being watched in "real time." If the second possibility is true, then the feds need not have splurged on globe cameras at all, when simple "shoe box"-style cameras would have sufficed.